Children's Discovery Park at Thanksgiving Point: Our boys love to play in the Noah's Ark pool and the squirting fountains. This park has lots of other fun things to see, too. Bridal Veil Falls: An easy hike that ends with a pool at the bottom of the waterfall. Bring a quarter and let the kids feed the fish. Payson Lakes: The lake here is beautiful. You can walk around on an easy, flat trail, or just play by the lakeside. The perfect place for a picnic lunch. Manila Creek Pond: A man-made reservoir. One side is for fishing, the other side has a beach and shallow end to swim in. There are no lifeguards here, so watch your kids carefully! Lindon Aquatics Center: One of our favorite pools. The kids section has pirate boats with slides--a big hit with the boys. There is also a lazy river, big slide, and hot tub. Highland Splash Pad: We think Highland has the best splash pad that we've visited. There is a river with rocks for the little kids, and a spraying fountain for the older kids. We spend hours here every summer. No shade--so come prepared. 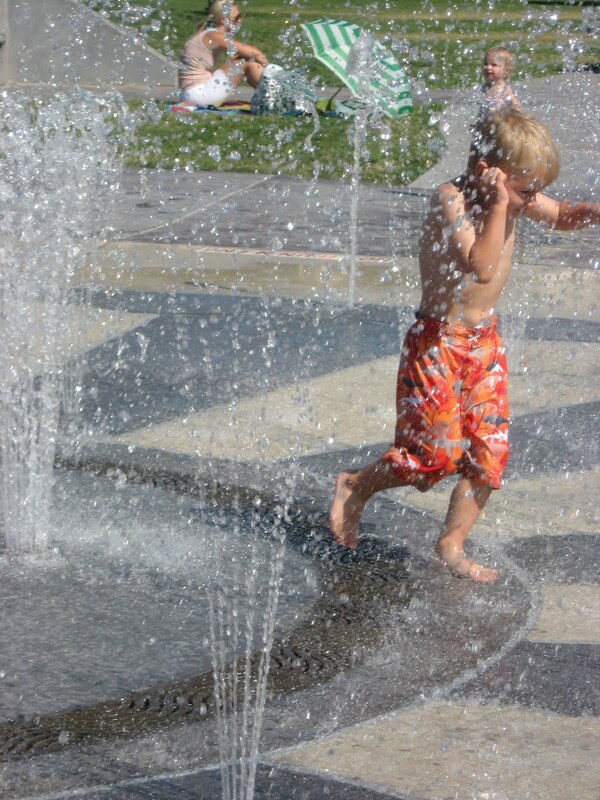 Snowflake Fountain at the Gateway: A fun fountain to play in when you visit the Gateway mall. Every half hour there is a big music show to watch, too. For more ideas you can check our water activities tab. I recently happened upon Highland Glen Park while I was running Murdock Trail. Beautiful beautiful pond! Thought I would share it with you. Thanks for the tip. This is on our short list to visit. We hope to head there soon.